Enter the Gungeon is under development by Dodge Roll Games, developers of last year's Fork Parker's Holiday Profit Hike. Their latest project is a top-down action RPG centering around an ancient artifact... a gun that can KILL THE PAST! (Leastwise, that's what the trailer claims.) In practice, this is a dungeon crawler where a bunch of guys take over-the-top weapons (lasers, cannons, rainbows, etc.) into enemy-packed environments and blast the pixels right off their cute pudgy faces. 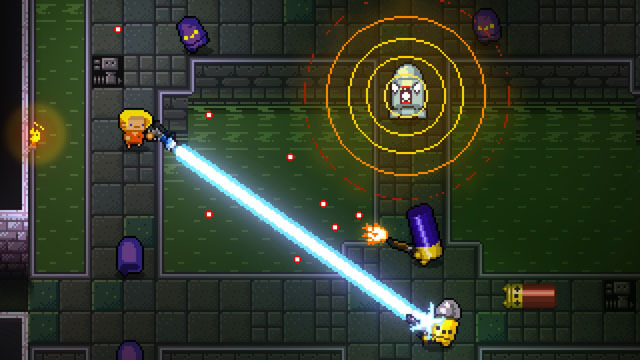 Players murderfy their way through the ever-changing Gungeon, taking down enemies and bosses, dodge rolling (of course), and grabbing loot to buy more powerful gear. The game is headed for PS4 via PSN, as well as PC, Mac, and Linux via Steam in 2016.